I used the Faux Chipboard technique from the Technique Junkies Newsletter on the larger flower stamp. On the center two clips I also used my cuttlebug flower die cut. 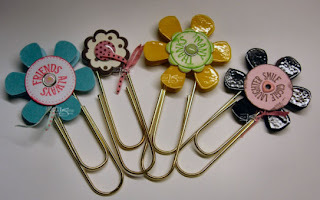 The fancy brad embellishments also came from ISC, as well as the Heidi Swapp ribbon.